Another one from our B-tech batch losing his bachelor status.. My project partner (a.k.a partner in fraud ) Ibrahim getting married on Jan-6.. He's special in many ways..
-- He studied quite a bit..And at the end of 4th year, he became an expert in FIFA-2000 :-) . -- NITC Football captain with a rather awesome victory streak in Calicut league :-). -- Now enrolled in M-tech @IITK, he aspires to come back to NITC and join there as a lecturer few years down the lane..I sincerely wish he succeeds in that. When do you realize that you are going through a bad patch ? -- When you take a wrong turn at a very familiar traffic junction..
-- When you get problems from the least expected sources..
-- When things which you'll normally do within an hour takes you about one day..
-- You blog when you should be sleeping..
-- When everything that u do hit one roadblock or other.. This is a unique place in the road-map of Bangalore ..or even in India.. The unique features of this place ..
1) This is a four-way junction under a flyover and over an under-pass with 8 roads , 2 each in each direction , all one-ways with well visible & working signals..Technically a well-thought about and well-designed traffic plan - an extremely rare piece of engineering in India perhaps ..
2) 90% of the people don't bother about the signals at this place.. Even if the signal is green, you'll have to look to all four directions and then take your vehicle. 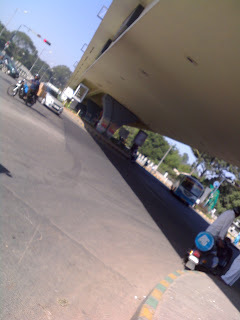 All are alike i n breaking signals at this place..bike riders, auto-wallahs , bus/car/lorry - drivers and even cyclists. 3) Only place where you can see vehicles taking all possible directions and U-turns simultaneously even if the signal is red . -- See the snap of this place..Taken at a time when there is not much traffic..but you can still see vehicles moving in all directions.. I'll upload another one once I get a full-traffic-jam picture at this location.. Sigh!!!.. Games Indians Play ...Also, read Vinay' post about driving at this place..
People have varying opinions about this IIT aspect in Dilbert..Some say it is a testimony to the success of the IIT system...Some say he's being sarcastic beyond a limit.. But either way, it is a good stress-reliever :-) ..
Why I didn't study Computer Science further ?? 2) A good amount of thesis work in Computer Science happens by improving complexities of existing algorithms.. And that too at an extremely low level of performance improvement.. I didnt find those attractive..
3) There is something called Chaos Theory in physics.. It deals with things like "how a bird's wing-flapping in Philippines would cause a hurricane in Argentina" and stuff like that..I strangely felt studying advanced theoretical computer science was somewhat like that..Studying things that are of abysmally low use to general public..
4) Most of my studies in B-tech were focussed on how to get a job rather than how to appreciate the subject ( Not the fault of anyone else ..but personal reasons.. ) . I regret having had that attitude during those days. 6) Perhaps the only technical subject that I was really interested in my B-tech days was 'Digital Signal Processing' ..This I studied in third year as an elective..And this was the paper in which I got the maximum marks in my entire B-tech life .. 49/50 in sessionals and 92 /100 in finals .. Murali Sir took that and his style of teaching was extremely impressive.. Strangely the interest towards this died down very quickly in final yr..I don't know why..but it happened...Maybe I feel, if I had done my final yr project in something related to software aspects of DSP, story might have been a bit different..
7) I started to read a lot of general things starting in final year.. This somehow cultivated an interest towards management.. This I'll admit anyday, the fat-salaries in investment banking and all were never a determining factor..I'm not suited for that life.. Rather it was a desire to do something different..something useful to the society..People may argue what real help does MBA graduates do to the nation & society other than inflating the foreign exchange reserves.. But there are exceptions.. There are people who really do useful things after MBA . And management education , be it in any form , equips you really well for that..Its a different matter whether you really do something or not.. But it definitely prepares you. These 'realizations' ( some friends call it fallacies ) somehow fueled my desire to do a management degree..
8) Professional factors.. I definitely see lot of scope in ERP sector if you have work exp in that & have an MBA degree.. More than MS, MBA makes sense here. -- Thats all I can recollect..I think I've covered most. How good is Amazon's delivery in India ? I see a lot of interesting books and DVD's on Amazon's site.. And quite a lot of them are not available in book-stalls in b'lore like Landmark.. How is Amazon's reliability over these online purchases ? I've stayed away from that mode of purchase after an irritating experience with Indiatimes .. And anyday, I'd prefer going to a huge bookstall like Landmark/Crosswords rather than buying online because of that atmosphere.. But, maybe owing to low demand, lot of books & DVD's are not available even in these top-class stores in India.. So, I'm thinking of trying Amazon.. If any of you are regular/one-time customers of amazon, could you please comment here or mail to ajithprasadb - at - gmail.com over their reliability/speed of delivery etc in India..